for $249,900 with 4 bedrooms and 3 full baths. This 2,351 square foot home was built in 2007 on a lot size of 0.49 Acre(s). GOT IN-LAWS??? THIS IS THE PERFECT HOME FOR YOU!! LOVELY 3 BDRM 2 BATH MAIN HOME PLUS 1 BDRM 1 BATH HANDICAP ACCESSIBLE IN-LAW SUITE WITH IT'S OWN LIVING ROOM AND FULL KITCHEN! 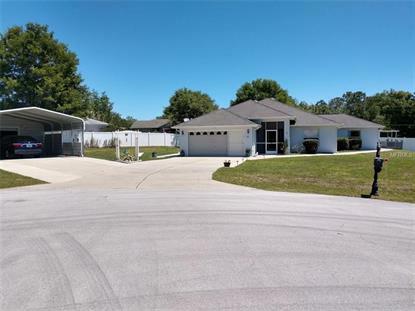 MAIN HOME IS SPACIOUS WITH SCREENED, COVERED ENTRY LEADING THROUGH ETCHED GLASS DOORS TO FOYER AND THEN ON TO LARGE LIVING ROOM, FORMAL DINING ROOM AND BREAKFAST NOOK AS WELL! KITCHEN FEATURES STAINLESS APPLIANCES, CLOSET PANTRY, LAZY SUSAN TO ENHANCE STORAGE SPACE AND BEAUTIFUL TUMBLED GLASS AND STONE BACKSPLASH. MAIN HOUSE AND IN-LAW HAVE ACCESS TO COVERED PORCH AREAS AND SCREEN ENCLOSED POOL. ALMOST HALF ACRE LOT IS PERIMETER FENCED WITH EASY CARE VINYL FENCING PLUS THERE IS A HUGE CARPORT WITH WORKSHOP IN ADDITION TO THE ATTACHED TWO CAR GARAGE WITH SCREEN DOORS. PARKING FOR YOUR RV WITH ELECTRIC SERVICE TOO!! SOLAR ATTIC FANS HELP WITH HEATING AND COOLING COSTS PLUS HEAT AND AIR IS LESS THAN A YEAR OLD!!! WELL KEPT HOME READY FOR YOU TODAY!